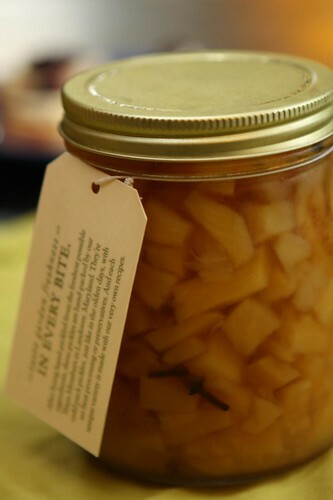 Sweet pickled pineapple! It's from Maryland, where all the best pineapples come from, and it just sounded like something that I would like. The only question was what I would do with it. A far as I'm concerned that's a small detail. This is pickled damn pineapple, people! We'll make it work with something. Jen was off in Boston all day, driving around and interviewing CEOs. She called me from a rest stop to complain that it is difficult to get anything on the road other than candy bars and the world's worst fast food. So it was that I felt compelled to make something much more wholesome for dinner, albeit still not light on saturated fat. 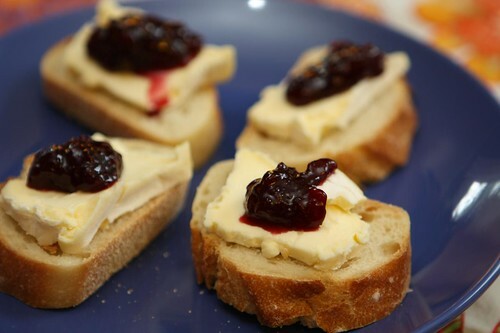 I started off with one of her favorite cheeses (D'Affinois) which I topped on a baguette slice with a scoop of sour cherry spread. 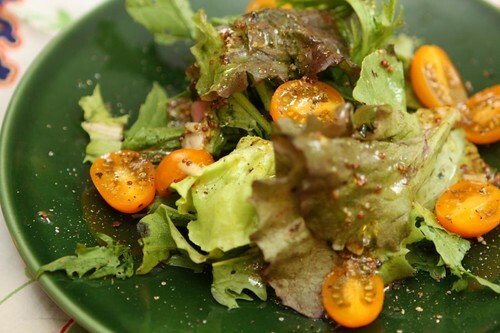 As an early balance I made a salad using some of the leftover red sail and mizuna lettuce with last night's vinaigrette and more Zima tomatoes. Zima tomatoes are apparently trademarked and are a new variety of tomato from this year (2011) as far as I can tell. They are essentially a yellow grape tomato that is super sweet. In researching this I see my quasi-French meal from last night would upset even more French chefs as it incorporates something new. According to my French culinary training new things can never be used or tried. Instead it must languish in a stagnant state of repetition which began stalling in this never ending loop some time in the 1950s. That's the true meaning of classical French cooking. For a second course I got these great Baby White Tokyo Turnips from Satur Farms. 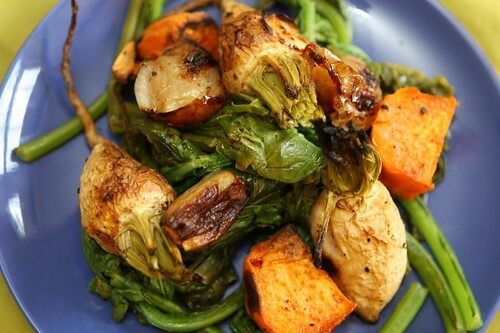 I roasted them in the oven along with some shallots, garlic cloves, and sweet potato. Since I'm not a big fan of wasting vegetable tops I took the turnip greens and wilted them in a little olive oil as a base. Finally I came to my much awaited pork belly. I'm not sure why but I've been thinking about pork belly a lot lately. Maybe it's because I have been imagining how that sweet pickled pineapple would be on it. Maybe it's that it is so cheap because it just doesn't sound that appealing. Maybe it's because it's 92% fat (thanks, Wikipedia)! Whatever it is the only way I can get something like this out of my head is to just make it. Or to suffer a concussion. I tossed some garlic cloves, onion, carrot, celery, and fennel in a pan with some olive oil then browned them up with the pork belly which I seasoned with salt, pepper, and cayenne before tossing in the oven for about two hours. I added a little vegetable stock to the pan near the end to help it now brown up. When it came out of the oven I put a healthy spoonful of the pickled pineapples over the top along with the roasted vegetables. I don't really know how to pair beer with food but it's not that big a deal since I don't really care. 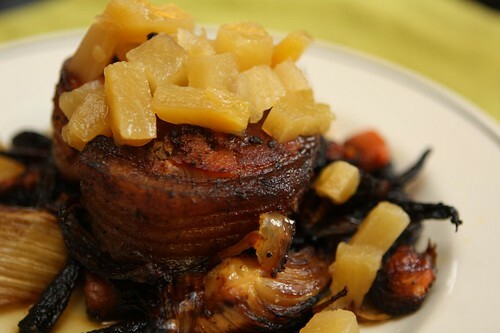 I did, however, look up on various websites what type of beer I should serve with pork belly. 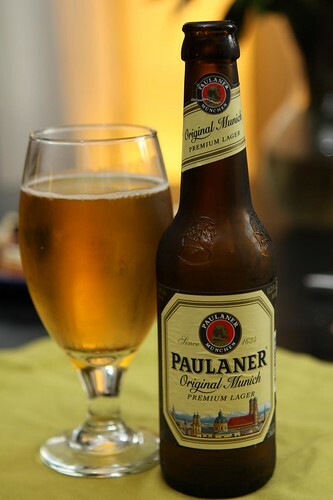 I wasn't really happy with any of the answers so instead I just had this Munich from Paulaner Brauerei München. I got some fantastic organic blueberries for a song at the market so I decided to make them into a variation on Jen's grandma's "Napolean" recipe. I crushed up some graham crackers and butter to make a crust, cooked some vanilla pudding and drizzled a small amount of the crust. Then I topped with a full pint of blueberries and the remainder of the warm pudding. 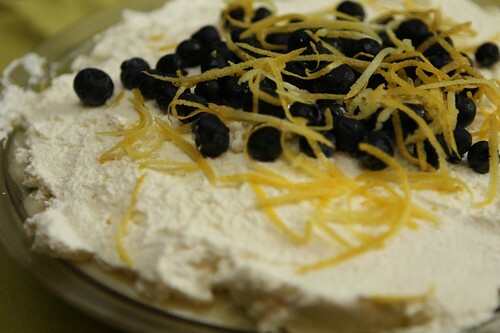 I tossed it into the fridge to chill for a few hours before topping with whipped cream and more blueberries. I zested some lemon right over the top to get a nice spray of lemon oil on the whipped cream layer. After a long work week (or eight days in my case) it's nice to settle down with tea, dessert, and a movie. My pick tonight: Top Secret. I haven't seen it in almost six months so I think I'm overdue. Hopefully Jen feels the same.